All of those who lived through the exciting years of early computer aided design, especially on personal computers, worked mainly in 2D and 2.5D environments. Progress in the direction of designing entirely in 3D was slow. One of the most frequently asked questions was, “How might we generate 3D models based on 2D drawings, and with little or no user interaction?” The answer was not easy, and changed as 3D systems advanced. Another question during the early CAD era was (and still is), “When should users and companies move to 3D?” The answer can summed up by the following benefits to designing in 3D. Accuracy in design, which removes ambiguity from interpreting 2D drawings, given to the ease and quality of three-dimensional visualization. 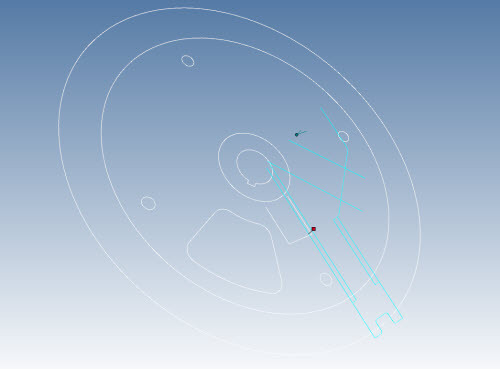 Commonality of designs, which allows reuse of the same 3D model for different operations, such as CAE (computer aided engineering) analysis, interference checking, assemblies, presentations, ergonomics, tolerance checking, thickness and draft angle analysis, and so on. Maintaining full associativity of 2D drawings generated from 3D models, with complete accuracy. Using 3D data received from vendors, and providing 3D models to clients. 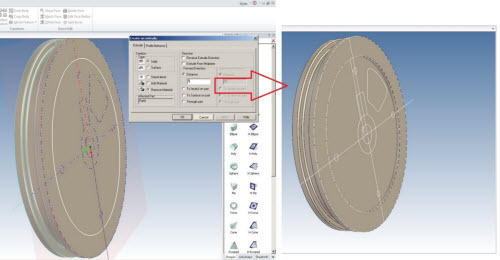 Generating CNC machining programs directly within the 3D model. 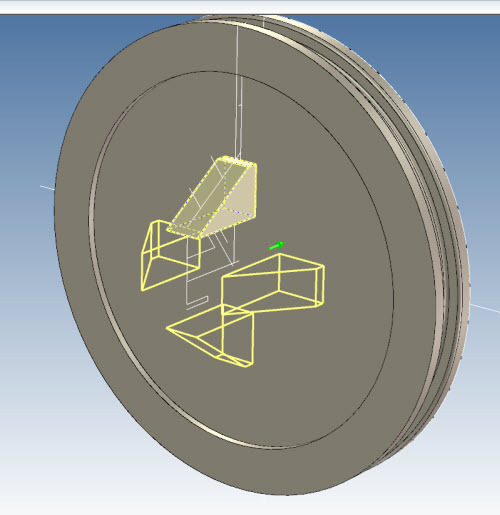 Rapid prototyping, which is easily generated from 3D models and sent as ST files to 3D printers. Lack of commitment by users and/or from the organization towards learning 3D. This stems from the fear of loss of productivity during the transition to 3D and the cost of training time, and by the lack of synchronization if the system is not used consistently. Rejection by designers to rules and methodologies that are imposed by 3D systems. For example, being required to place parameters, impose constrains, create relations, and apply intuitive management systems. Specific needs for the maintenance of legacy data, including compatibility and 3D links with 2D original data. Strong tendency by users to design in 2D, because of traditional technical education and work experience in two-dimensional environments. Difficulty of working with large volumes of legacy data. Based on these points, we can define the ideal CAD solution that is able to minimize all these risks (and rejection by users), as well as facilitate the reuse of existing 2D data, maintain legacy data, and keep the interaction between 3D and 2D models – all with ease of use and quick learning. Needing 3D, or wishing to move to 3D. Reusing existing 2D data to generate 3D models. The idea is to know in advance how much time, effort, and complexity would be demanded from the user during the 2D-3D transition. They depend largely on the MCAD system, and of course on the user’s education and technical expertise. 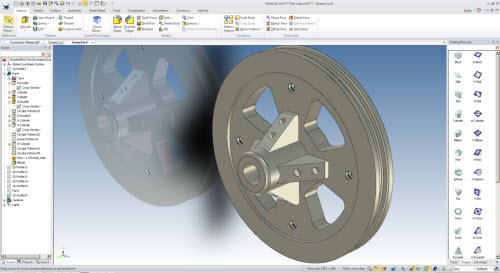 The problem is, however, that many existing MCAD system on the market do not have all the tools needed to easily leverage existing 2D design data, and reuse it in the creation of 3D models. And so this article is dedicated to a review of IronCAD. It promotes itself as a system that facilitates the reuse of 2D data through (a) a powerful integrated 2D application, (b) easy copy & paste 2D to sketch, (c) simple to use drag & drop design with limited restrictions to worry about, and (d) the rapid creation of 2D drawings from 3D models. So, let’s go to analyze the 2D to 3D process through an actual use case. I used IronCAD 2014 SP2 on a 64-bit Windows 7 installation. The first step is to open a drawing; in my example, it is the DWG file shown in figure 1. Opening the 2D DWG drawing file in IronCAD is as simple as using File | Open. IronCAD opens the drawing in an environment that looks familiar, similar to AutoCAD or other 2D CAD software. I found I had no problems controlling the drawing visually (zoom, pan, and so on) and by editing the geometry (delete, size and position modification, dimensions control; see figure 2). 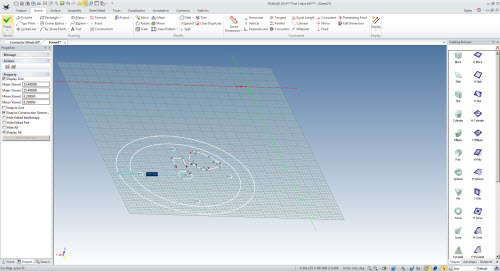 Of course in this environment I had available for use the Properties browser for inserting geometry, common tools for geometry creation and detailing – as well ones specific to mechanical applications, like threads and gears, and a very rich parts catalog that allowed me to insert library component by a simple drag-and-drop method. After preparing the imported 2D geometry by editing it a bit, I was ready to use it in the 3D environment. The initial process, which in other systems is complex, is very simple here thanks to IronCAD 2014’s copy-and-paste system. 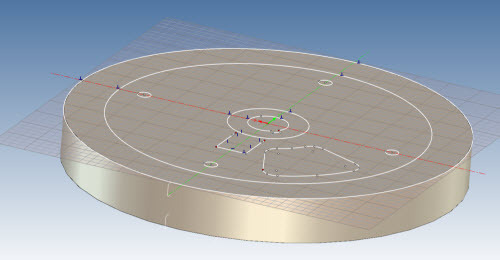 I chose the front view, and then selected the relevant geometry to be used in the model, mainly the holes and reference shapes (see figure 3). To use this geometry is very simple: first copy it by clicking the icon, using the copy command, or pressing Ctrl+C and then create a 3D document via 3D Scene (with other environments also possible; see figure 4). I choose the IronCAD Blue Reflection Scene environment. Then I created a new Sketch and pasted the selected geometry via Ctrl +V (see figure 5). Inside the sketch environment is possible to create and modify the existing shapes; in my case I found it convenient to move the geometry to the origin, coordinates of 0,0 (see figure 6). 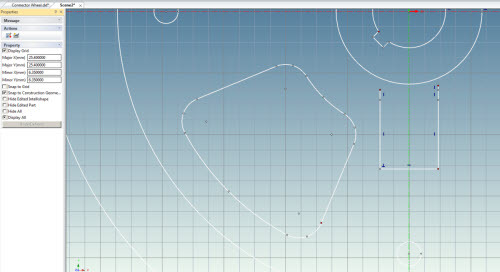 My next step was to clean and modify the geometry using the sketch tools (see figure 7). I repeated the same steps but for the lateral views of the reference drawing; in this case, the target sketch was on the YZ plane. 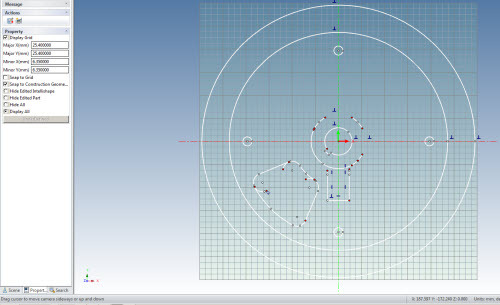 Because of the reference geometry type available in my drawing, this would be the best option, although IronCAD can also generate 3D entities from unique sketches; this is completely up to the user depending on the available graphics data and his experience (see figure 8). Now was the time to start using the geometry to generate 3D features. 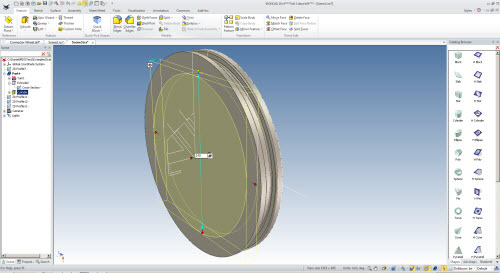 I began with the external diameter: through an interactive method, I created an extrusion based in this circle (see figure 9). All this by the clicking the right mouse button on the geometry and then selecting Extrude from the pop-up dialog. I could have used other methods of generating geometry from the sketch, but I find that generating 3D features entity by entity is best. This interactive method lets me analyze each step, and gives me the choice of working with either geometry or functions. But then I decided to change my approach, because I had more details on the side sketch. A second path is for users with a little more experience and patience, but also it allows the reuse of geometry (that was imported from the drawing as sketches) in a more controlled and user-interactive method. This approach let me create as many sketches on different 3D planes as needed. Figure 10 shows the result of the solid spin feature, based on a profile generated from a partial extraction of the geometry of the side view. Continuing, now I made the pockets; that is, I had IronCAD extract material using the Extrude command. To do this, I used one of the imported circles included in one of the sketches (see figure 11). 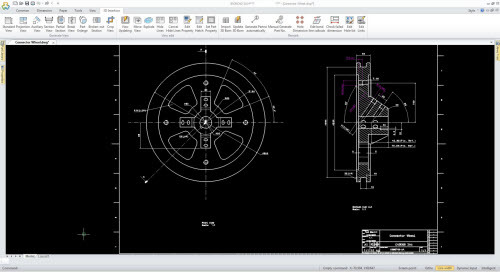 The same operation can be performed using the smart features of IronCAD. In this case, I would select the Cylinder object from the Catalog Browser, and then drag it to the desired position (centered and positioned on the face). This is done easily, allowing me to dynamically change the position, size, and direction of the cylinder extrude, which removed the unwanted material (see figure 12). 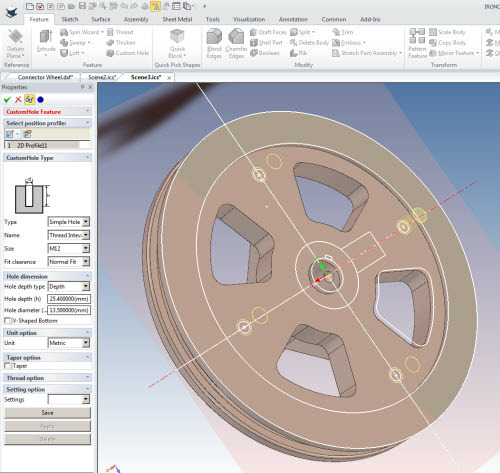 IronCAD offers a great variety of possibilities for creating, editing, and reusing geometry, and so users can decide which tool is most suitable for each case and shape. For instance, using advanced tools like the TriBall interface, the Create Multiple Rotated Copies, Mirror, or Pattern commands, I inserted multiple repeating objects, as the circulating pattern shown in figures 13 and 14. 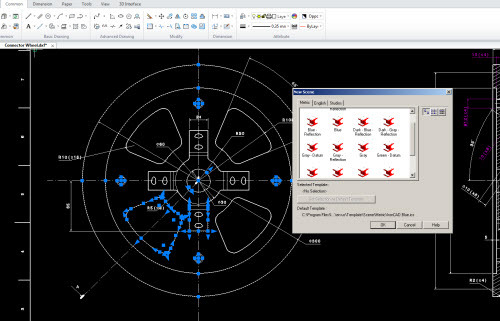 It is notable that the advanced graphical interaction of IronCAD 2014 allows increased flexibility, while significantly reducing the number of commands and steps to follow. Handling these, however, requires some training, more for some people than others, of course! To add geometry is very easy: just drag Shapes or AdvShapes from the adjacent Catalog Browser. 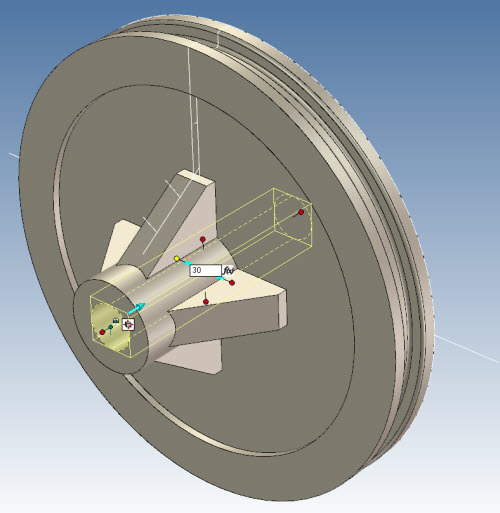 In figure 14, I added the central cylinder from the catalog. 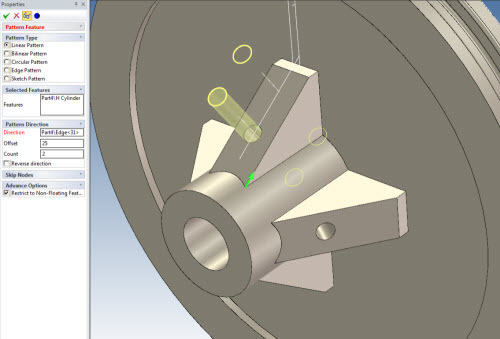 Holes can be made from the imported geometry in the drawing, or with the hollow cylinder shape from the Catalog Browser. I found the latter option to be faster and easier, because I knew its dimensions (diameter and depth; see figures 15 and 16). I created the remaining holes in a similar but different manner, because they are threaded. Here, it was much more convenient to use the Custom Hole command in IronCAD. I found this pretty easy to use, because I needed to specify just two things: (a) the selection of the part, where the hole is to be applied, and (b) the sketch where the geometry (a circle, in this case) is located (see figure 17). A special feature that I want to note here is that IronCAD automatically recognizes all holes and their positions in one shot, and so had already previously created the center points. The menu options, and the insertion of custom holes, is user-friendly and simple to use. I could select different types – such as Simple, Counter-bored, Countersunk, Counter-drilled, and Tape r- and the units (Metric or English), as well as the types of threads (size and pitch) with its representation (if applicable; see figure 18). The final steps to complete the model included adding details, such as fillet and chamfers (see figure 19). With the part finished, I could now generate 2D drawings based on this 3D model, maintaining their 3D-2D full associativity, and double checking the model’s shapes and dimensions. 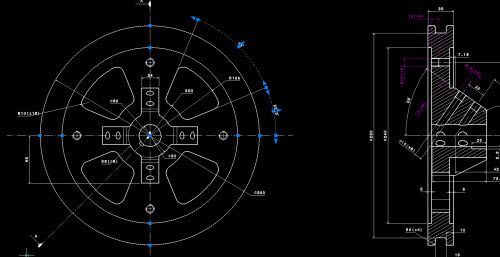 The principal method in IronCAD is to use of the simple drag and drop operations to build 3D geometry, but it also uses 2D sketches to make 3D geometry, as needed – all without the prerequisite of complex reference planes or any dependence on interactions between geometry, which is too commonly found in other MCAD applications. 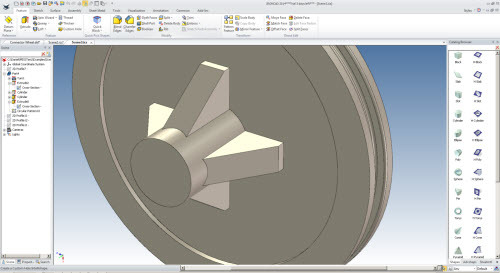 A point favorable to IronCAD2014 is there is no necessity of any add-ins to perform these operations, as all these functions and an integrated 2D mechanical application are included. Other MCAD systems require them to their detriment, including some of high ranking. IronCAD 2014 offers a wide range of options for better managing the three-dimensional development of 3D models from geometry extracted from two-dimensional data. 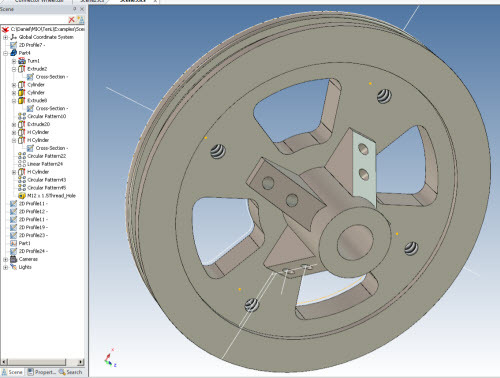 It is able to do this by combining the reuse of geometry from drawings and sketches for traditional users, and making use of special features like the TriBall and drag-and-drop shapes from the Catalog making it quick and easy to use. 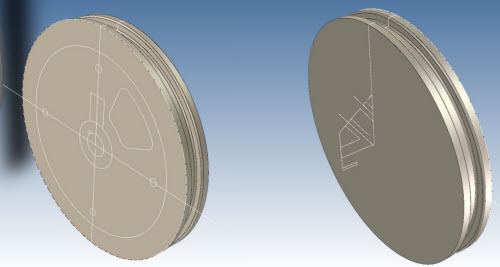 IronCAD showed itself capable of solving the problem I stated at the onset: how to convert the existing mass of 2D drawings into 3D models – and all the benefits that accrue when designs are 3D.